The Landscape Architectural Accreditation Board (LAAB) invites comments on its proposed revisions to the LAAB Accreditation Standards. LAAB last approved revisions to the standards in 2016 as part of its periodic review of its standards. LAAB conducts a formal, comprehensive review of the accreditation standards every five years (page 4, LAAB Accreditation Procedures). The proposed revisions are posted on the LAAB website under LAAB News & Actions. LAAB currently accredits first professional programs at the bachelor’s and master’s level in the United States and its territories. Of these programs, all are traditional programs housed within universities and colleges throughout the United States. While some courses within a few programs are offered via distance education, there are no LAAB-accredited programs that currently offer a large portion or all of their curriculum online. However, as more students enroll in online courses and programs during their time in higher education, the demand for an LAAB accredited online program will likely grow. About 5.8 million students were enrolled in at least one distance learning course in a U.S. institution in fall 2014—up 3.9 percent from the previous fall, according to Online Report Card: Tracking Online Education in the United States, an annual report by the Babson Survey Research Group. Additionally, a majority of calls received at ASLA regarding landscape architecture education involves the availability of online programs. Therefore, LAAB has undertaken the process to review its standards relative to the delivery of online courses in landscape architecture. This review began in February 2017 and its timeline is included below. LAAB began discussion of the potential for incorporating standards language that would allow the assessment of online delivery of courses in landscape architecture bachelor’s and master’s degree programs. The board agreed to sponsor a visit to the only known institution offering large portions of landscape architecture degree programs online—Academy of Art University (AAU)’s BFA and MFA in landscape architecture. Ned Crankshaw, FASLA (LAAB/University of Kentucky); Kelleann Foster, ASLA (Pennsylvania State University); and Kristopher Pritchard (LAAB) visited AAU in San Francisco to review pedagogical process and outcomes in their programs. LAAB invited Dr. Leah Matthews, executive director of the Distance Education Accrediting Commission (DEAC), to discuss online professional program accreditation. Dr. Matthews confirmed LAAB’s general direction concerning additional review areas needed for online program delivery. The board discusses next steps in a deliberative process of online standard development and evaluation. Each step involves input from LAAB’s community of interest and board review and revision. LAAB shared AAU visit summary and ASLA Committee on Education discussion summary with LA program leaders and invited them to provide any feedback and comments to LAAB. LAAB reviewed and discussed an initial draft of standard(s) and assessments directed toward online educational delivery. LAAB organized a panel discussion about online professional degree program accreditation. Comment period on draft standards is open through June 1, 2018. LAAB will analyze comments received and frame a revision of draft standards with final language development following the meeting. LAAB now invites members of the community of interest and the public to review the proposed revisions, available on the LAAB website, and to comment on them. We welcome comments and input on the revised LAAB Accreditation Standards document until Friday, June 1. 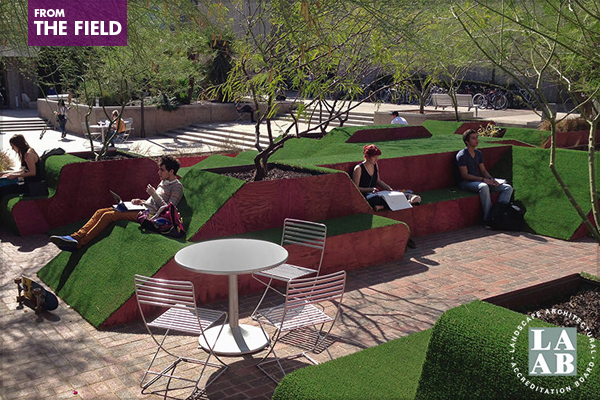 Comments may be sent to Kristopher Pritchard, Accreditation & Education Programs Manager, at kpritchard@asla.org. LAAB anticipates final adoption of the revised Accreditation Standards by winter 2019. Follow-up questions and inquiries may also be directed to Mr. Pritchard.